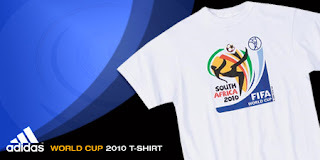 That’s exactly why we’ve twisted, pushed and prodded adidas to make us this awesome new OFFICIAL World Cup 2010 T-Shirt. Okay, truth is we really didn’t have anything to do with the making of this shirt (it’d be so cool if we did) - though, as usual, we’re one of the few places on the planet where you can get this officially licensed piece of World Cup 2010 merchandise, brought to you by one of the official sponsors – adidas – who will be providing most of the gear, including the balls—which we’ll also surely be getting before anyone. So, even though I have never blogged about a t-shirt before, I’m glad that my first time talking about something made of cotton, it’s this special product, sure to go very quickly, as these shirts always do.